After a village church ceremony Pippa and Will drove back to their garden at the end of the lane along with their gorgeous baby boy Harry to celebrate. It was a very personal wedding with her sister Kayleigh Tarrant obviously on the signage and lettering, myself and Matt Horan on flowers and photography (we couldn't have done a bad job of Kayleigh's 2 years ago) and Elle Jane on cake duty. When Matt's wife Rachel came up with the wedding video I was SO blown away with emotion I had to share. If any brides to be want a fully cohesive and seamlessly beautiful wedding that might just be a little more stress free, you are safe in our hands. We LOVE working together and have done so many times before. If you see this and would like to know more about a Collective Wedding then lets talk! Wreaths were the first floristry type thing I started doing. I've been making them for a few years now - way before weddings, they used to make my stall look nice at Christmas when I sold vintage things. 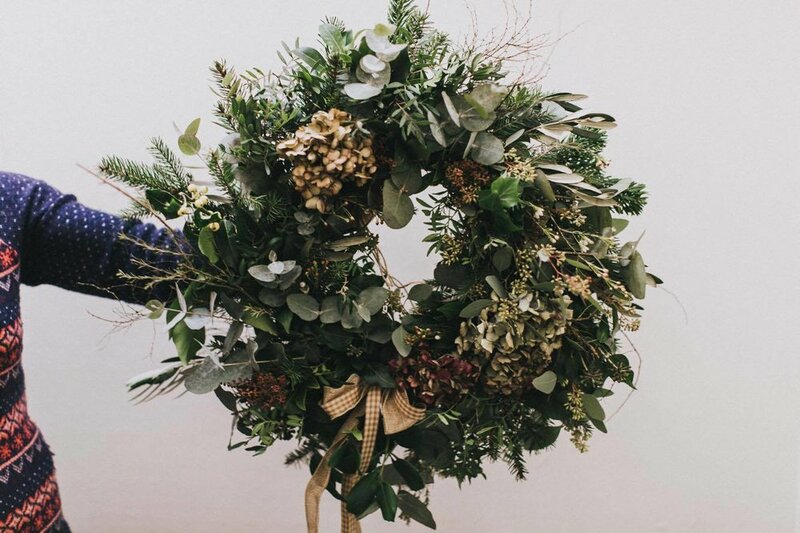 After making them for friends, family and anyone else who wanted them for a couple of years - and learning how to make them properly at Swallows and Damsons wreath school - last year I decided to run a workshop in my local village hall. I filled it in 2 days so this year I ran 3! This year I have found a 'legal' supply of locally grown spruce which has helped avoid a few dodgy looks. I still love foraging at this time of year though, nature continually gives even in the depths of winter. Spiky hawthorn branches, which I always regret when ramming everything in the car, all varieties of ivy and holly with multi coloured berries. And of course I can't forget the annual drive by pinching of pampas from a friends front garden. I hope everyone who came this year is proud of their creations. It amazes me how no two wreaths ever seem to be the same, like snowflakes. For me it doesn't get much more Christmassy than making your own wreath whilst sipping on mulled wine and eating mince pies, the scent of Christmas most definitely in the air. We chose my parents in laws quintessentially English garden on the south Nottinghamshire border as the location for our first shoot which made for a relaxed and informal setting to showcase our work. Using the original apple store as a backdrop highlighted the flowers beautifully. Together we form a local Wedding Collective, a meeting of creative minds with a shared vision of simplicity, attention to detail and authenticity within our specialised areas. Our shoot has been featured on Whimsical Wonderland Weddings blog and is due to be in the next edition of Save the Date magazine. The picture above of the wild and romantic bouquet that I put together featured David Austin Kiera roses and peonies along with foraged flowers and foliage from our garden. I was thrilled when it came runner up in June's #underthefloralspell on Flowerona blog which I couldn't quite believe as I saw it sit aside some of the UKs top florists work.